Jeremy Guscott scored three tries on his England debut. In only a few years, Romania had gone backwards in rugby, no longer the country that could beat France, Wales, and Scotland. Even at home, they were no match for a supercharged England back line, in which black winger Chris Oti scored four tries. Simon Hodgkinson's 19 points included eight conversions. Guscott, who had been linked with a switch to league all season, was asked about the lure at the post-match press conference. He said he had a clear message for any league scouts watching: "You're wasting your time." 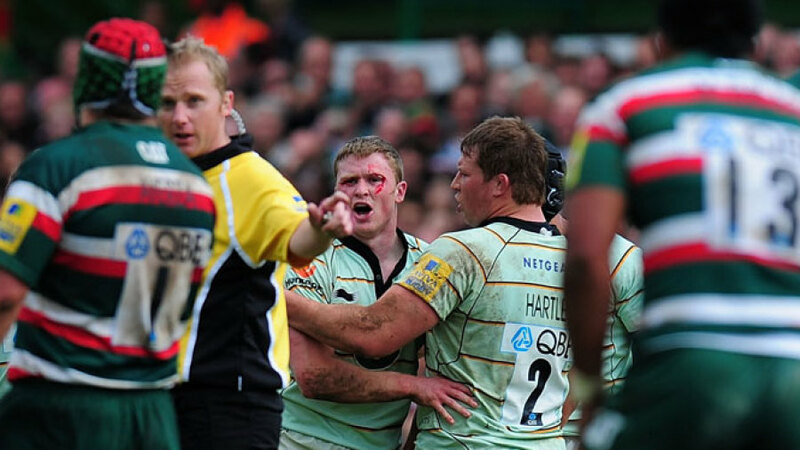 Leicester's Manu Tuilagi was condemned in the media for a "cowardly" off-the-ball attack on Northampton's Chris Ashton. Tuilagi took Ashton out with a high tackle, Ashton pushed him and Tuilagi responded with three punches to the face "that David Haye would have been proud of". Tuilago somehow escaped with a yellow card - Ashton, bleeding from the hits, was also yellow carded by Wayne Barnes - but acting on TV replays, the RFU hit him with a five-week ban. Neil Back's worst fears were confirmed when he was hit with a six-month ban after petulantly pushing over referee Steve Lander after the Pilkington Cup final ten days earlier. Back's defence, which was accepted, was that he had intended to push Bath's Andy Robinson but nonetheless he felt the full force of the disciplinary panel. Leicester were unhappy, a spokesman saying: "Neil's adamant that, although he pushed someone, he had no idea it was the referee … we accepted-it had been an instinctive reaction. He was confused and did not intend to show disrespect to the ref." Lander said: "I'm satisfied the principle of not laying hands on the referee has been upheld. You can feel vulnerable out there with such power and energy surrounding you." Back was ruled out for 10 league games and did not return until early November. Saracens centre Tom Shanklin became the first back to be signed by new Welsh region Cardiff Blues. Shanklin had won 12 caps for Wales and lined up with fellow internationals Iestyn Harris, Jamie Robinson, Rhys Williams and Craig Morgan in an impressive back-line. International forwards Ben Evans, Craig Quinnell and Gareth Williams had already joined in the new squad. On their first overseas Test tour Ireland were beaten 24-8 by South Africa at Cape Town in the only international of the visit. Ben-Piet van Zyl and Colin Greenwood both scored braces for the Springboks, with No.8 Doug Hopwood scoring their fifth try. All of Ireland's points came from fullback Tom Kiernan, who converted his own try and landed a penalty in front of 35, 000 at Newlands. Ireland become the first Home Union to win a Test in the southern hemisphere, defeating Australia 11-5 in Sydney. Centres Paddy McGrath and Jerry Walsh were the heroes with a try apiece, while skipper and fullback Tom Kiernan weighed in with a conversion and a drop-goal. Australia's points came via a try from legendary scrum-half Ken Catchpole and a conversion from Jim Lenehan. Leicester won the inaugural Zurich Championship final, beating Bath 22-10 in front of 33,500 spectators at Twickenham. The much-maligned Championship final was seen by many as a dress-rehearsal for Leicester's Heineken Cup final meeting with Munster a week later, and the Tigers eased to victory thanks to tries from Martin Johnson, Austin Healey and Winston Stanley. The Cavaliers got their tour back on course following defeat in the first Test against South Africa. The New Zealand team's dirt-trackers defeat Natal 37-24 with Robbie Deans landing four goals.